Fun fact for all you tyre geeks: “Hans Dampf” loosely translates (from German) to Handy Man. 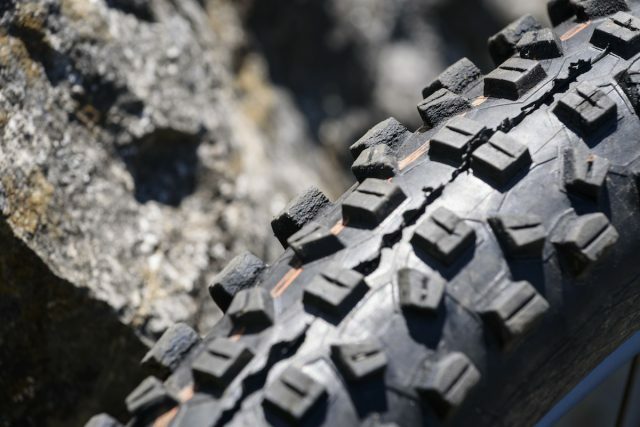 The top of the Schwalbe range has recently seen a major update in the form of four new Addix compounds (Speed, Speedgrip, Soft, and Ultrasoft). These replace the previous Pacestar, Trailstar, and Vertstar compounds, and claim to be grippier, faster rolling, and more durable depending on your chosen compound. The Addix Soft compound we have on test is designated with a new red stripe running through the tread, and while Schwalbe is playing its cards close to the chest and haven’t released any information regarding specific compound ratings, after a good squidge of the knobs we reckon this is somewhere between 40a – 45a. 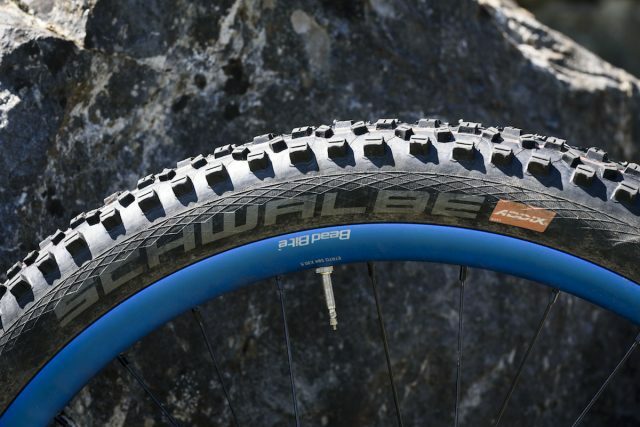 German brand Schwalbe has updated its high-end tyre line with the new Addix rubber compound. 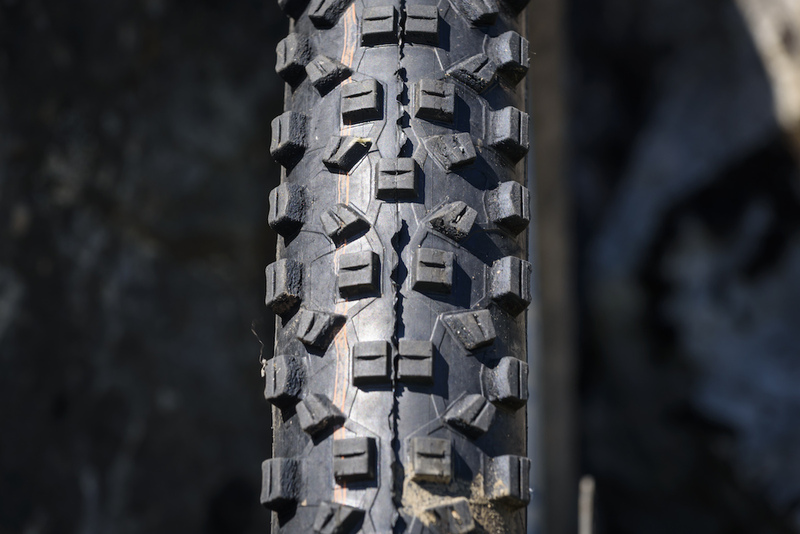 The venerable Super Gravity casing remains the same as before, and features a dual-ply, 60tpi construction with extra reinforcing to help prevent sidewall slashes and snakebite protection, bringing the tyres weight to a not inconsiderable 1100g. 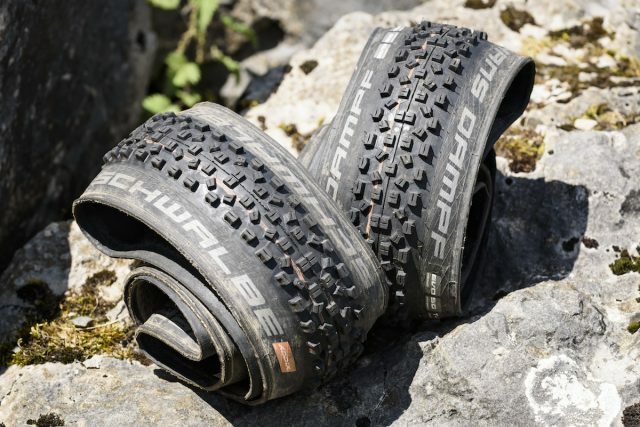 If you’re more of a trail rider and aren’t one known for ripping tyres apart, Schwalbe offers exactly the same tyre in a single-ply SnakeSkin 127tpi casing that drops weight right down to a claimed 795g. 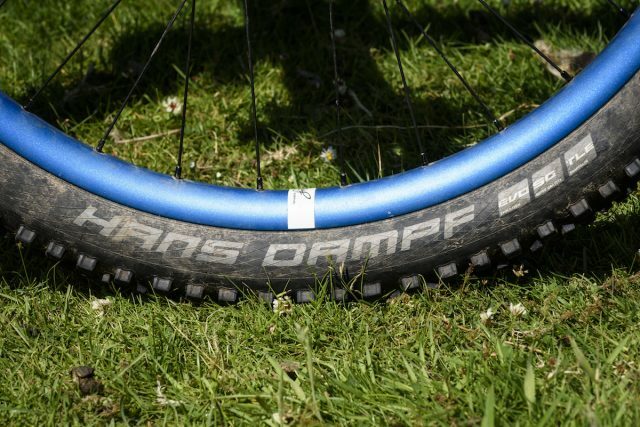 The Hans Dampf has a rounded profile with large, closely spaced knobs and cornering on fireroads and man made hardpack trails is hence predictable and smooth. Elsewhere the compound grips to dry rock well, however on asking harder questions, both front and rear give up quickly. This may prove somewhat surprising to those who are used to squarer, and more open tread patterns with a pronounced transition onto the edge knobs. The Hans Dampf tread pattern features blocky knobs that are tightly arranged for faster rolling. The rounded profile creates a very consistent feel for cornering. Through loamy, muddy and rooty trails, both climbing and descending was good. In fact on wet and dry mud we couldn’t really fault the cornering grip from either end. If anything the front didn’t pull you round like a more aggressively edged tyre would, but it never stepped out. The grip from the compound stuck well to wet rock where possible – when conditions were as slippery as they get, the tyres did very well, and wet grass was despatched equally well. Braking control is great in dryer conditions, but with a lack of any long rectangular tread blocks, the Dampf gives up fast in anything steep or loose. 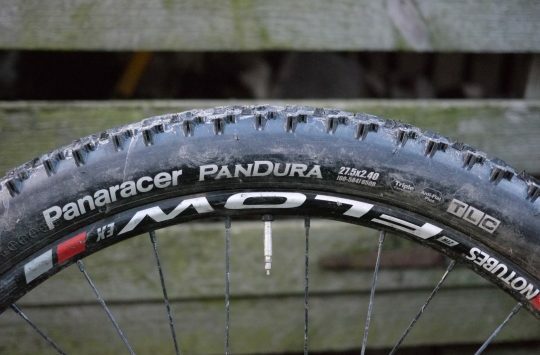 In loam and over roots, the tyres work ok, but if you’re regularly hunting out those sort of technical trails then we’d recommend something with more bite (such as a Magic Mary) at least on the front. Run at 27psi front/32psi rear, the new Addix compound felt suitably grippy, and on dry rock the tyres climbed brilliantly. When things got wet, climbing traction was similarly impressive and on pebbly and rocky technical climbs, the sticky rubber hung on where expected. In spite of all this traction, rolling resistance has been good and they haven’t worn in the centre too badly. Unfortunately, some of the side knobs do appear to be starting to tear slightly, which we’ve experienced with older non-Addix compound Schwalbe tyres. While they’re certainly more durable than previous Hans Dampfs we’ve tested, we had higher expectations given the new fancy Addix compound. Also available in a lighter SnakeSkin version, the Super Gravity Hans Dampf weighs a portly 1100g per tyre. 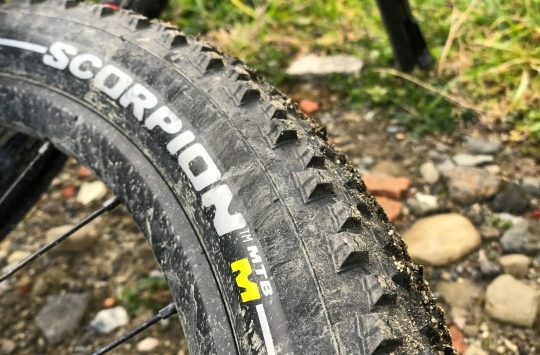 Despite Schwalbe’s claims of added durability with the new Addix compound, our test tyres are already starting to show signs of tearing around the cornering blocks. They popped up onto a variety of rims (Stans Flow EX mk2, DT Swiss EX471, and Spank Oozy 345) with nary more than a quick blast from a track pump. Unfortunately, 100m into the first downhill on the first ride, there was a loud braaaaaaping sound from the rear tyre that took us by surprise as we hadn’t felt any significant impact. Towards the end of the noise we felt a tiny kick and on stopping, the tyre was deflated with a rip on the tread and a flat spot in the rim in the same place as the rip. Our best guess is that the tyre burped out on cornering or in a dip in the trail followed by a rock doing its worst whilst the tyre was down. A good case for Huck Norris or similar? Maybe, but these tyres aren’t light and we’d rather just run a more durable tyre to avoid both the burping and the tearing issues for the same weight as a Super Gravity and impact strip combination. Having said all that, this was on a big old rocky descent in the Lake District that is renowned for being mega tough on tyres, and there’s always a bit of luck involved. 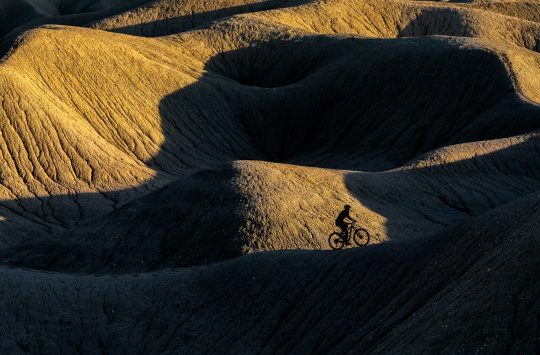 If your usual riding terrain isn’t as extreme, then the standard casing may be all you need. The Hans Dampf was one of the best all-round performers in our group test. As the name suggests, the Hans Dampf is a great all rounder, performing above average in most trail conditions. The rounded profile offers consistent levels of cornering grip, and it also rolls really well for its given weight and size. 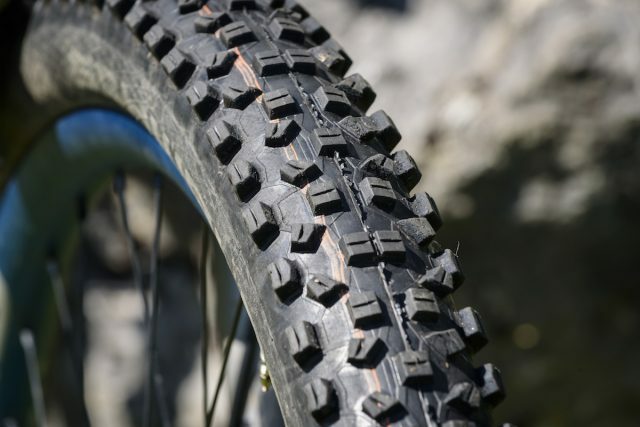 Unless you’re riding in much looser and steeper conditions where we’d suggest pairing the Hans Dampf with a Magic Mary up front, the Hans Dampf is a versatile trail bike tyre for all year round use. As for the new Addix Soft compound? Well it is nice and sticky, but while it’s improved durability-wise over previous Hans Dampf tyres, we’re still seeing the early signs of knob rippage a little too soon for our liking. September Online Deals - Tyres, Sombrio, Jackets, Carbon More!! Love a Hans Dampf in the dry but I find them dreadful in the wet.